The fall begins, and leaves appear in our home. Maya, age five—her magpie tendencies energized by her fellow kindergartners—collects them on the playground at recess. She admires the symmetrical lobes of a greenish-brown oak leaf, then the Japanese maple's dainty mahogany fingers, beckoning like magical harbingers of a hopeful new age. I briefly turn her collection into an excuse for a science lesson about the colorful role of carotenoids, but stop when I see I'm pulling her away from pure, unadulterated observation. Instead, I step back and watch as the bundle grows, a thickening waxy packet of arboreal treasure, stacked and stashed at the bottom of her backpack. As a child in the '80s, I had my own fixations, among them a flexible ruler that reminded me of my parents' forehead strip thermometer, albeit larger. In a way, it took the temperature of the nation, featuring tiny oval portraits of every U.S. President—a ruler ruler. Two long horizontal rows of white men, most of whom were dead. I studied the ruler like Maya considers leaves, looking for variations, anomalies, and categories. 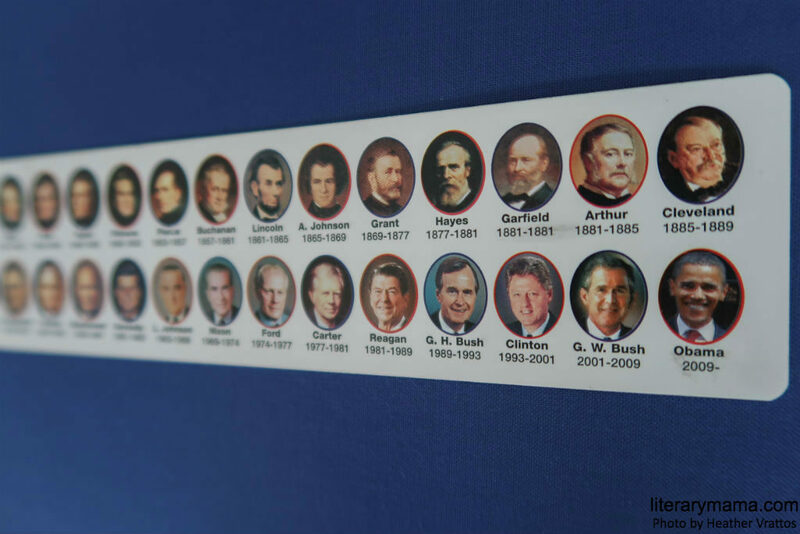 Given that all the presidents were white and male, I categorized them according to other factors: by the directions their heads were turned (left or right), by their facial hair (beard, moustache, or none), and expressions (stony-faced or smiling). I could turn my own head sideways, like the presidents; I fit into the "no facial hair category"; and I possessed a full range of expressions. Still, I had trouble imagining myself on that ruler. A classmate with bolder vision told me she intended to be the first female president. Sometimes, optimistic, I believed it would happen, envisioning her appointing me Secretary of Education. Other times, optimistic in a different way, I believed my friend would be disappointed; after all, she wouldn't be old enough to run for president until 2020, and what were the odds that a woman still would not have been elected by then? More than 20 years later, it's 2016, pre-election, and my family and I poise ourselves for the second scenario I'd envisioned in my childhood optimism, for our first female president to conquer America's persistent 'isms and 'ogyny. I plan to buy Maya the latest version of my childhood ruler, post-inauguration. For now, though, the only school supply she needs is a folder. In October, I slide it into her backpack, careful to avoid damaging the increasingly brittle leaves below. Maya has big plans for the leaf collection, and decay hasn't entered her mind. Her intention is a grand art project, leaves displayed on an ambitious, collage-style, autumn tableau. For now, though, she's focused on Halloween. She wants to go as a weeping willow, so we turn last year's homemade mermaid costume into the body of the tree. We cut slits in the tube of green fabric and tie on green ribbon for the branches, and then we fashion a tissue box from the top of a paper grocery bag, in case the willow has occasion to "weep." No one else is a tree, and I love that she doesn't notice or care—a delighted, flowing, sprightly vision in green. That afternoon, on the streets of DC, vampires drool blood and samurais wield swords, but my willow's eyes widen most when she sees someone walking through our uber-liberal haven in a suit and mask: "That was Donald Trump!" The following week, on Election Day, my husband is away, so I take both kids to vote. We have to get to work and school, so we're in line before 7 a.m. I tell my tired, cold five-year-old and tired, cold two-year-old that we are lucky we can exercise this Constitutional right. "It will be worth it," I overpromise. "One day, you'll tell your own kids how I woke you up early to vote. We're voting for the first female president!" I have fantasies of the joyous celebration we will have when Hillary wins tonight. I am misled, buoyed, by my memories from 2008, when my husband and I joined the congregants of an African-American church in DC to watch the election results. When Fox 5's "YOU DECIDE 2008" displayed "OBAMA ELECTED PRESIDENT," we stood amongst a swell of hallelujahs. Congregants rang bells, strangers hugged, cell phone circuits overloaded, and the audible eruption inside echoed the sounds from outside—horns blasting on U Street, drivers yelling, "O-BA-MA!" out of their windows, and people on the sidewalks crying it back. That night, as we waited to hear Obama's acceptance speech, the pastor lifted a small African-American boy named Tyler to the microphone. "What do you want to be when you grow up?" he asked. "A president!" Tyler proclaimed, and we clapped and cheered. This year, as we stand in line to vote for Hillary, I imagine my daughter (or perhaps myself) as the new version of that little boy, celebrating the achievement of what had once been a dream. And so we vote, and hope his/herstory will be made. Back at home, I finally face the crisp leaf fragments that fill the bottom of Maya's backpack, ground down by folders and time. I am not certain that she knows the extent to which a leaf inevitably crumbles—not sure if she, too, has been ignoring the mounting accumulation of dried flakes in her pack or has been happily unaware, still dreaming of her foliage collage. Just in case it's the latter, I wait until she's asleep to unzip the backpack, and then turn it upside down over the porch railing and shake. Dried bits are finely ground into the pack's seams, their aging fragmentation a reminder that kindergarten, too, passes; that not everything we hope for can endure. The next morning, I tell Maya the outcome of the election. Forcing myself to maintain eye contact, I speak in a measured tone, trying to play down the event, hoping to shield her from my own grief, and from my trepidation about our president-elect. Voters made their choice, I say. This is the democratic process. We can still look forward. There will be another presidential election in four years. As I speak, Maya's eyes widen. Then she breaks my gaze and stands in silence, thinking. I wait, holding my breath. Maybe she doesn't care. Maybe we can eat breakfast, as usual. "I want to scream," she says, finally. I tell her that I understand. But I don't tell her that I threw away her leaves.